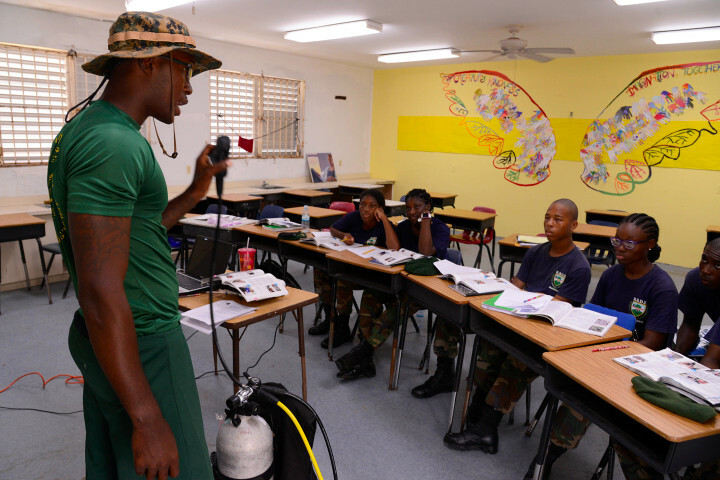 Able Seaman Michael Gibson, a RBDF Dive Instructor demonstrating the use of dive equipment at the RBDF Rangers Summer Camp in Grand Bahama. Coral Harbour Base (RBDF): Twenty-four (24) Royal Bahamas Defence Force Rangers are working towards their Open Water Dive Certification at the Rangers Summer Program in Grand Bahama. The 3rd Annual Rangers Leadership Summer Camp, which is currently being at St. George’s High School, is designed to develop character and leadership skills among the Rangers. The Professional Association of Diving Instructors (PADI) Open Water Dive Course is one of several units being offered to the participants. In addition to becoming familiarized with dive equipment, underwater knowledge and hand signals, students are required to complete a total of 6-7 qualifying dives, during which time they have the opportunity to utilize the lessons taught. Defence Force Rangers performing one of their underwater dives at the RBDF Rangers Summer Camp in Grand Bahama. Colin Woods, a student of North Eleuthera High School was excited about the experience. Upon completion of the course, all of the rangers participating in the training will become Scuba Divers International (SDI) Certified Open Water Divers. 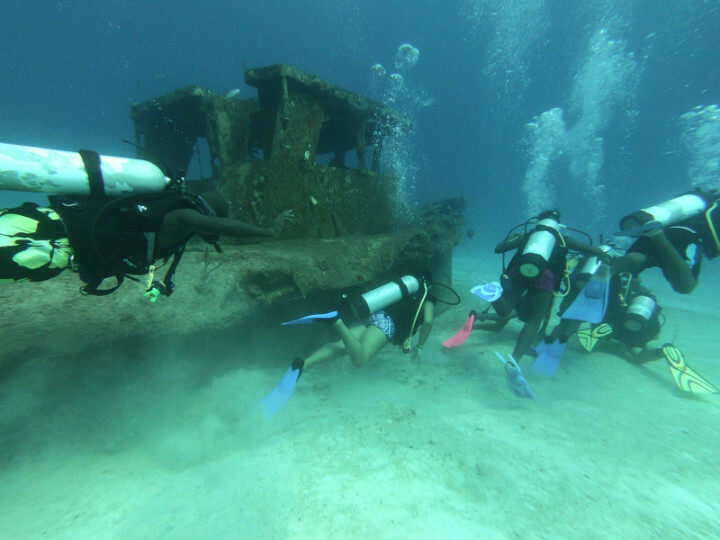 Instructors for the course are Fred & Malinda Riger, owners of Grand Bahama Scuba. They are being assisted by Able Seaman Michael Gibson and Ms. Sherry Wood (Open Water Diver and volunteer). Jerai Brennen, Ranger Officer at Forest Heights Academy, Abaco, also spoke about her first time diving experience. Ms. Sherry Wood, an Open Water Diver and volunteer speaking to the Rangers at the RBDF Rangers Summer Camp in Grand Bahama. Able Seaman Gibson, a PADI Certified Diver lauded the efforts of the students as he also spoke of their experiences. 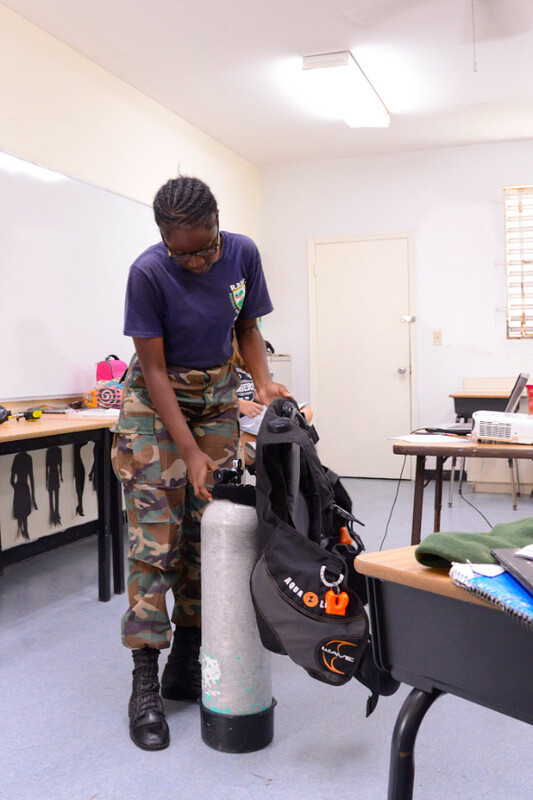 RBDF Ranger Carissa Francois, acclimatizing herself with the dive equipment at the RBDF Rangers Summer Camp in Grand Bahama. “A lot of them had a fear of fitting their gears and getting in the water because of sharks,” said Gibson. “When the students got into the water, they then realize that sharks are not dangerous creatures, rather being around them is a defining experience. The only downside is that plenty of them cannot swim, but dive gears make it possible to achieve their goals of diving and swimming underwater”. This year's leadership camp curriculum covers several units. They include: Rangers Officer Training Course; Rangers Advanced Officer Training Course; RBDF Marine Candidate Familiarization Course, Photo Journalism Course; and a PADI Open Water Dive Course. The camp culminates on August 2nd at the school.